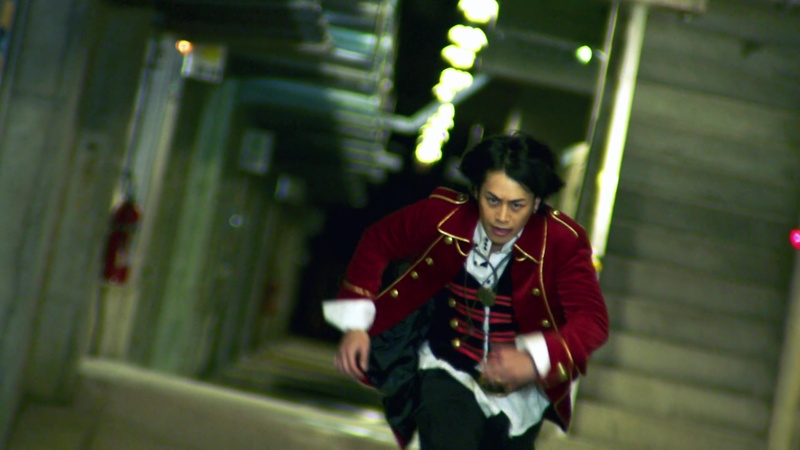 The Gokaigers (minus Luka) are being absolutely wrecked by a mysterious purple knight. Marvy-chan confronts the knight and he is shocked when the knight uses Luka’s attack. Just then, a mysterious gold ticket appears in front of Marvelous. Meanwhile back in Tokyo, Keiichiro also gets a gold ticket. A young woman pops out of the ticket to say he has been chosen to participate in the Super Sentai Strongest Battle. If he wins, he can have any wish granted. Keiichiro says he only has one wish. 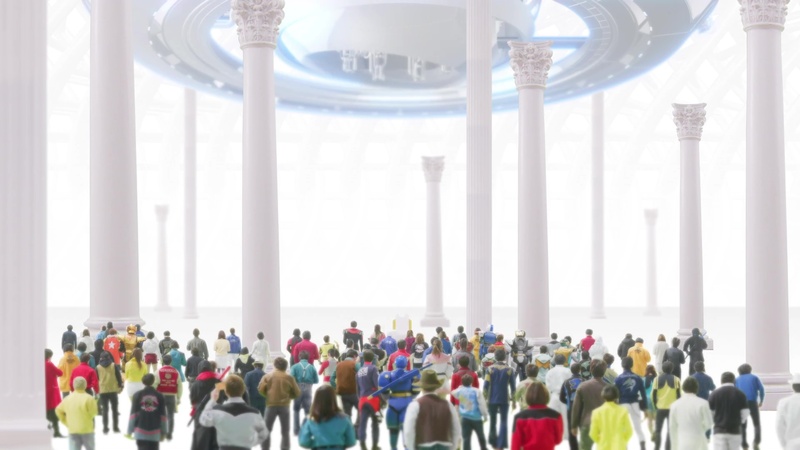 He is suddenly transported, along with all the other Sentai participants, to some kind of large hall in a strange planet. 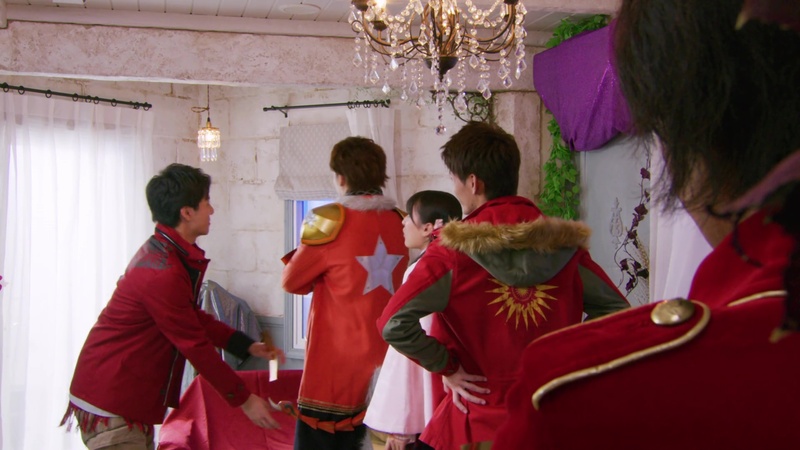 Also spotted are Yamato, Takaharu, Kagura, Stringer and Marvelous. Keiichiro acknowledges all these sempais who have fought before him. Yamato immediately notices the newbie. The woman from the invite, Rita, welcomes them all to Planet Nemesis. She says she is the protector of the Moebius Connect which can create a miracle every 500 years when the universe aligns. So whoever wins this battle will have their wish granted. She first splits everyone up into 32 teams of five. 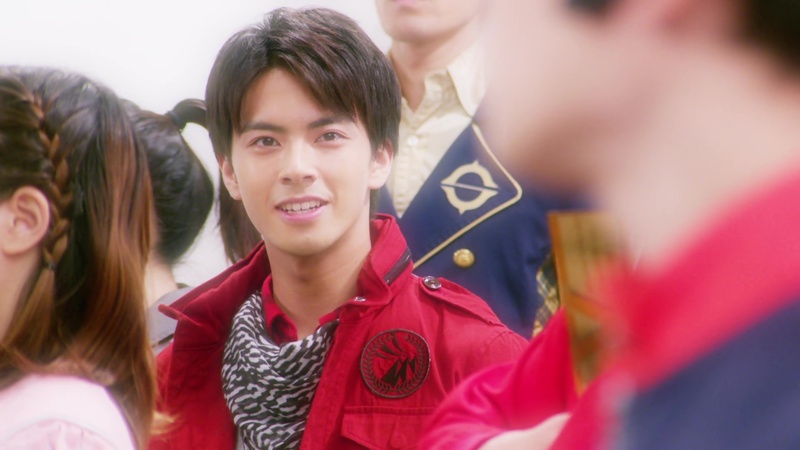 Yamato is the last one to get beamed away and he smiles at Keiichiro thinking they will get along very nicely. 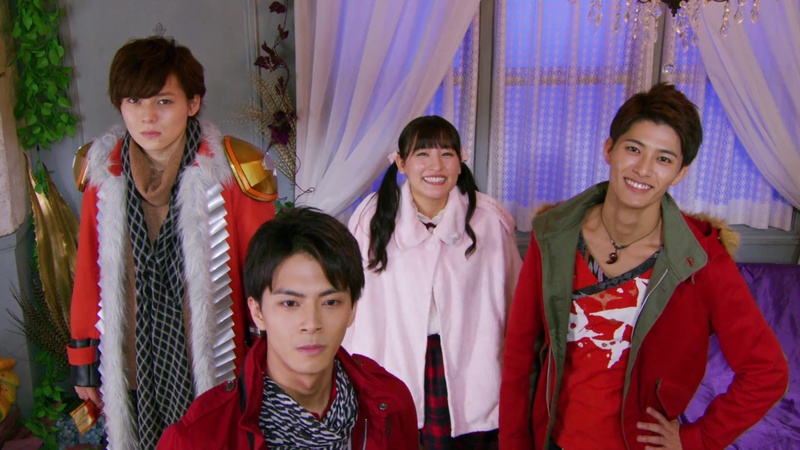 Yamato finds himself in a team with Kagura, Takaharu, Stinger and Marvelous. Yamato says they should introduce themselves. Takaharu goes first and says his wish is to become the nuLast Ninja. Kagura says her wish is for her family to be happy. Yamato says he wants to keep a certain (secret) promise. Stinger has his back to everyone else. Kagura notices his tail and she excitedly grabs it. He spins around and tells her not to touch it. Yamato asks if he’s a Zyuman. Stinger introduces himself and Kagura is amazed that he’s an alien. Yamato asks to touch his tail. 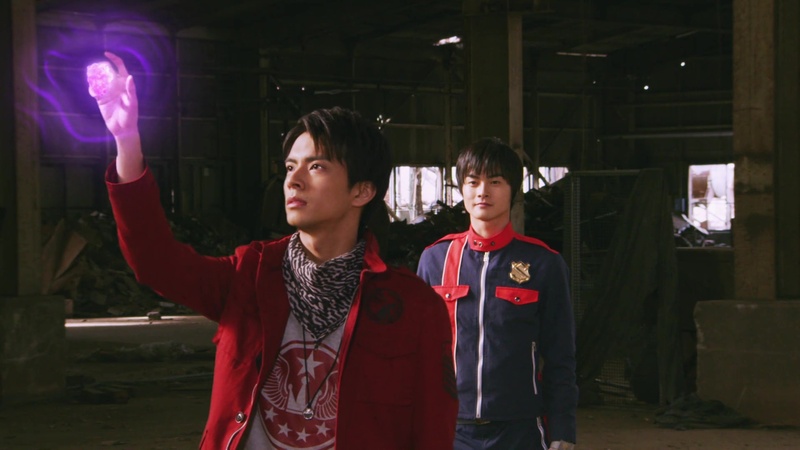 Takaharu turns to Marvelous Oniisan. But Marvy tells them not to talk to him. Yamato introduces him to the others instead since they’ve already met before. Kagura thinks he’s scary. Rita appears and announces the tournament will begin. The members of the team that wins five matches will have their wish granted. In the first bracket, it’s the Oddball Team (Yamato-tachi) versus the Serious Team. 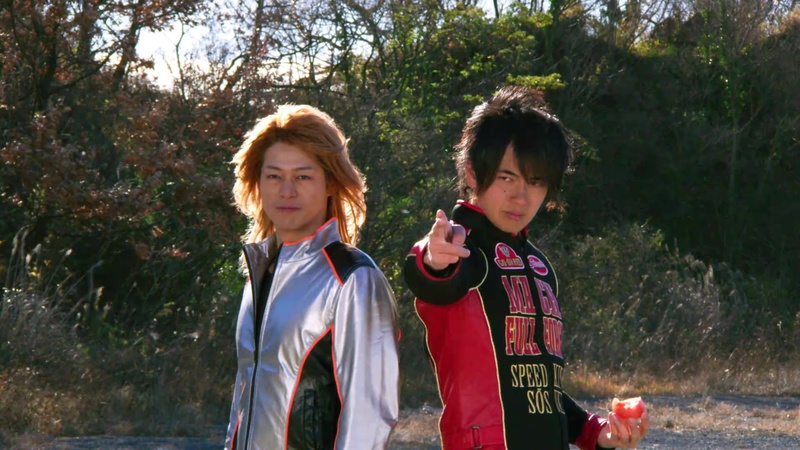 And battling first will be Yamato and Keiichiro. Yamato can’t believe he’s an Oddball, but it’s alright. He heads to the battlefield. Keiichiro bows and says while reluctant to fight his sempai, he will do his best. Yamato tells him it’s alright. They’re not trying to kill each other, after all. Rita appears to explain the rules. Moebius Connect causes the planet’s energy to crystalize into gems. The first person to grab the gem in each face-off wins. When they grab the gem, it is transferred into the Nemesis Pulse. And when the gems fuse into a giant crystal, it can grant a wish. Rita declares the first round has begun. Yamato and Keiichiro morph and they battle. Other battles in this first bracket continue in the other three locations, the Quarry, a Rooftop and an Underground Carpark. Team Oddball are watching the action from their HQ. Back at the Waste Warehouse, Yamato is impressed by Keiichiro. Keiichiro says he has a wish greater than anyone else’s: World Peace. Yamato demorphs and invites Keiichiro to come and sit. Keiichiro says World Peace is what everyone on the Serious Team wishes. Yamato says all of them wish that, but they just don’t say it. World peace isn’t something one person can give. Its something everyone in the world must work together to achieve. Keiichiro understands. 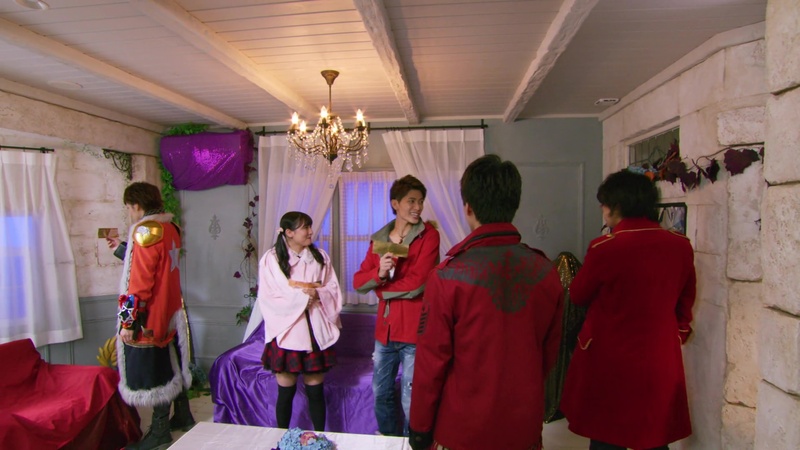 Takaharu and Kagura think this exchange is very refreshing. Keiichiro asks Yamato what his wish is. We don’t hear it though and Keiichiro allows Yamato to grab the stone. Keiichiro says Yamato’s wish deserves to be granted. They will all continue to fight for world peace in the future. As the next section of the bracket commences, Yamato returns to HQ. 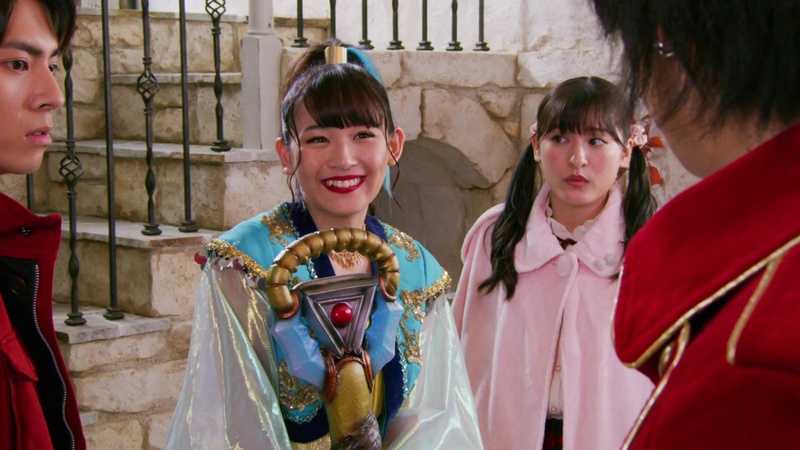 Kagura and Takaharu congratulate him on being a nice guy. 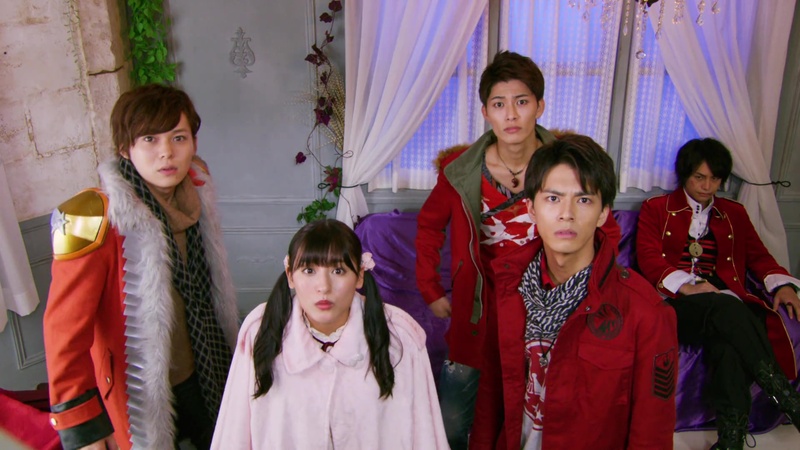 But Takaharu says they’ve got to keep going. He turns to Stinger and he agrees. Marvy-chan plops down on the couch as Kagura asks Yamato about his wish. Takaharu says they couldn’t hear Yamato and Keiichiro earlier. Yamato wants to keep it a secret for now since he feels embarrassed about telling everyone. Rita excitedly watches the next battles wrap up. But suddenly, Gaisorg appears on the Rooftop battlefield. Rita does not recognize Gaisorg as being from Super Sentai. Gaisorg is disappointed when he easily defeats BoukenYellow, Green Sai and GaoBlack. He wants a stronger opponent. When the others see Marvelous recognizes Gaisorg, he initially tells them to mind their own business. But he eventually tells them about how Gaisorg has been attacking Sentai teams to find the strongest person in the galaxy. Kagura says this is no time to be playing around in the tournament then. Rita pops in to confirm Marvelous’ information and she promises to take care of the situation. She pops out again to start Round 2. Kagura says it’s like magic how she can pop in and out like that. For this second round it’s Stinger and Takaharu against BoukenSilver Eiji Takaoka and Go-On Red Sosuke Esumi. Before they leave, Marvelous warns them to stay out of it if Gaisorg appears again. The battle begins. Sosuke tries summoning Speedor, but he gets no response. Stinger engages Eiji and asks him if he’s noticed anything strange while on the planet. Eiji says there seems to be a powerful jamming signal blocking access outside the planet, though they’re all still able to morph. 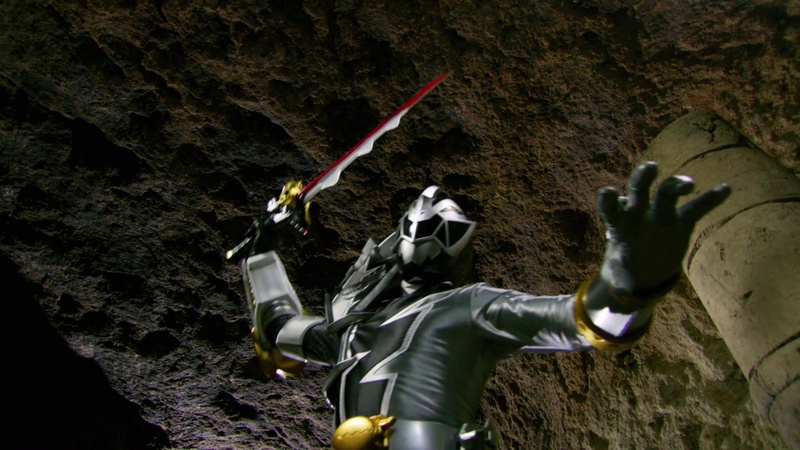 When Stinger blocks Eiji’s attack, he sees it bounce off an invisible barrier in the sky. He remembers Kagura mentioning “magic” earlier. 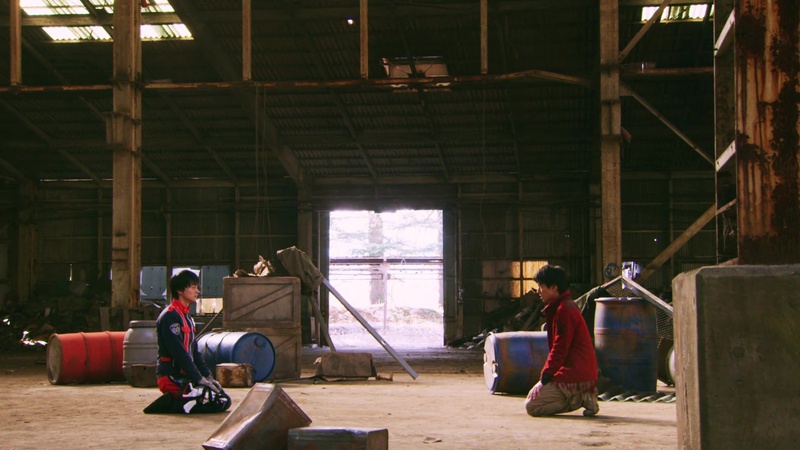 Eiji and Sosuke have Stinger and Takaharu on their backs so they approach the stone. But they bump into each other and force themselves to demorph. While enjoying some celery and tomatoes, Takaharu is able to swoop in and grab the stone. Eiji and Sosuke wish them well before getting zapped back. But just then, Gaisorg appears and sends Takaharu and Stinger flying! Marvelous quickly runs out. Elsewhere, we get a Ryusoulger tease. Yes!!! I’ve been looking forward to this since it was first announced! Definitely the most excited I’ve been for anything Sentai or Power Rangers-related since Kyuranger, to be completely honest. I actually very much like this All-Star “Oddball” Team. It’s a great mix of personalities and would be fun to watch for more than just four episodes. Anyway… looks like we have another “Have your wish granted” plot eh? Considering we just did that with LuPat, it does feel kind of tired. But it’s a good reason to have the Sentai teams fighting each other. Like, a charity match or something. They’re more willing to fight each other for the wish, even if it’s just light and not serious or “real” in the sense that they hurt each other badly. 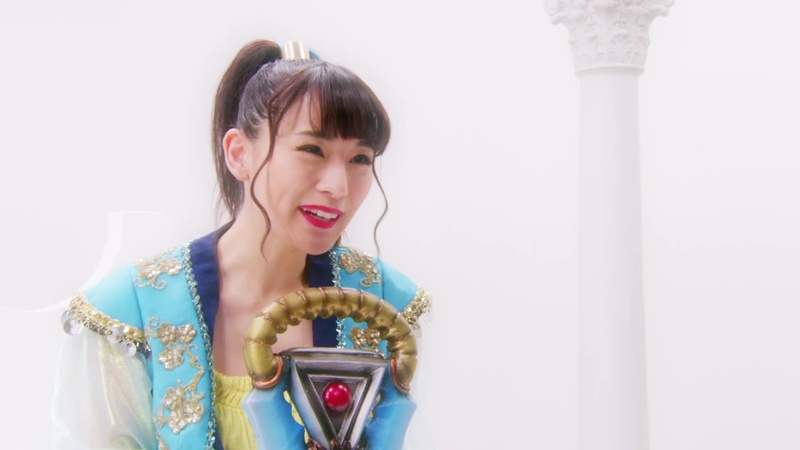 Obviously, I wouldn’t be surprised if Rita ends up the Big Bad and put this tournament together just to use the Sentai teams to get her a galaxy-dominating power. But the Gaisorg-aspect seems to add a different element to the plot. I definitely liked Kagura’s wish. She just wants her family to be happy. That’s a wonderful wish and certainly something Kagura would think of. So cute. Though I wonder if she’s supposed to still be a kid or grown up already. It’s only been four years since ToQger. I also liked Yamato’s explanation to Keiichiro about world peace being achieved by not just one person, but by everyone. Certainly a little preachy, but it worked. Anyway, I can’t imagine what Yamato’s wish might be. I assume Marvy-chan’s wish has something to do with Luka being missing. And Stinger seems to be all business, as expected of him as well. 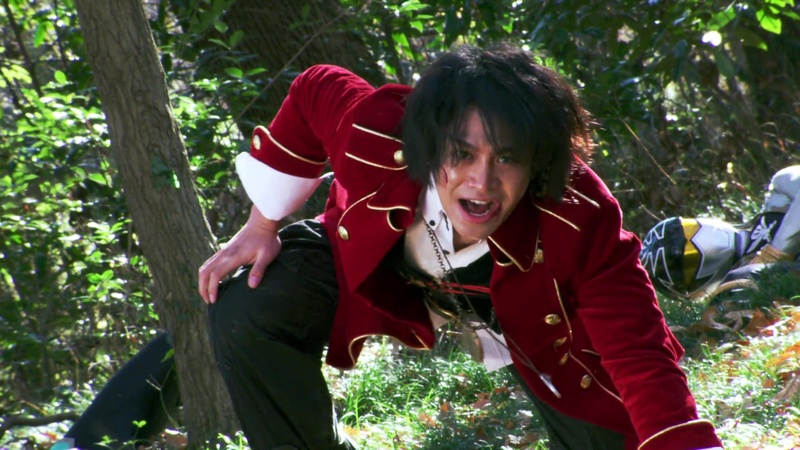 Takaharu wanting to be the new Last Ninja is kind of annoying though since it’s like a check off the box kind of thing by the writers who likely know nothing about Ninninger and just read his character description instead. Elsewhere, watching this also reminded me of one of the biggest reasons I hate Saban Brands (though hopefully not Hasbro) recycling the MMPR theme song for every season since Samuari. It was awesome here getting to hear the actual, unique themes for each Sentai team as they battled in this episode. You won’t be able to get that for any of the Saban Brands Era seasons since they would all sound like MMPR. No unique musical identity for those Ranger seasons and that’s a shame. Overall, this was a fun time and it’s great seeing old friends again. Hope things get even more exciting for the next episodes! 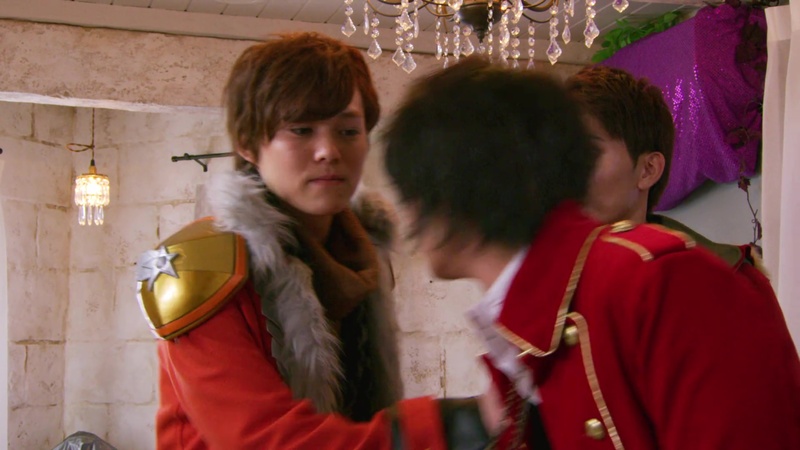 Yeah I was surprised how much I liked Kagura and Takaharu together. Maybe Takaharu sees Fuuka in her and it’s a nice big brother-little sister relationship.